What better to do of an early morning than check out the work millinery on line. A visual feast before my eyes while the sun is still crawling above the horizon. This is Luke Song. He may be my new infatuation. This photo is from a New York Times story about the maker of Aretha Franklin’s hat. You know, the sassy, old schoolish but rad one she wore to the 2009 presidential inauguration. The photographers for the NY Times did a smashing job with the photos that accompanied the March 3, article on Luke Song. Song’s shop is in Detroit. He took over the business from his parents. It’s a smashing success despite the fact that millinery “is a dead art”, sez Song. But look at that color!! Look at the glitz. Beautiful Afro church ladies, I love you! I’m stoked, as we, from the land of surf culture, say. I learned amazing things from this NY Times article. Song attended Parsons New School in NYC. His hat shop owning parents were aghast. ART ???? No Way. They refused to continue to pay for his educationwhen he abandoned biochemistry. He sold a prized cello, says the NY Times, to buy the freedom to study art. He would be a painter. The burden of students loans persuaded him to work for the family business. The mighty, mighty, Aretha Franklin, is one of Song’s best and most well know customers. She wore the now famous big bow hat to the inauguration and brought big blessing on the house of Song. I have to admit feeling a certain reverse-snobbishness when it comes to the NYT. The towering bastion of all that is literary I.D. sticks in my craw a bit. I do appreciate their history. it’s just a strange quirk of mine. I have chuckled, silently, in my head, at the NYT commercials that bleed from MSNBC or CNN International on the weekends. I’m at the sewing machine, no hands free to mute the annoying barrage. You know the bit. Youthful hipsters, walking in white space relate the specific NYT sections that seduced them. ” We met over the New York Times,” says half of a young couple. “I think it was the Entertainment section,” the other half responds. “I think it was the Fashion section,” the other partner corrects. But, hey, here I am drooling like a big sweet dog over the Luke Song article in the NYT. A few years back, while I was still trying to figure out what sorts of things I might create, I found a very simple and very cheap technique for making silkscreens. It must have been on a crafter’s site online. It’s probably still out there in cyberspace. It may even be easily intuited by many but I’m going to share it here. I’ve made a few of these embroidery hoop silkscreens. Large and small. This first picture is a Mayan image. This second image is also Mayan. It’s a little more difficult to see. I made it from a silk scarf and I must have used gloss-lustre Mod Podge. 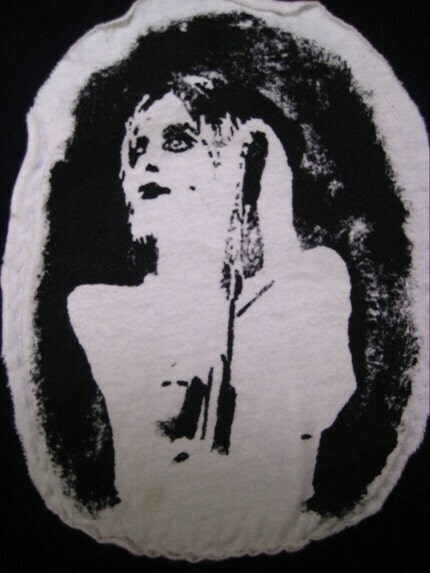 The third image is from that crappy looking silkscreen. It doesn’t look like much but it works great. 1) Find or create an image you like. 2) Get an embroidery hoop large enough to fit around the image. 3) Find some old-school sheer curtain material. Fit it snuggly into the embroidery hoop. 4) Lay the hoop over the image so the material lays flat against the image. 5) Trace your black and white areas with a dark pencil. 6) Flip the screen over so the drawn image is not touching your work table. 7) Mod Podge all white areas, all the areas you Do Not want ink to penetrate. Be generous with the Mod Podge so that you really seal up the material. It will then hold up when you rinse the ink out. 8) Let it dry a good 24 hours. Once dry, hold your screen up to the light and make sure that there are no holes in your covered areas. If there are just cover them with with more Mod Podge. You have now created your cheapie silk screen. You can lay it over the surface on to which you will print it, leaving it in the hoop or taking it out. I am applying the image onto cloth so I take the screen sheet out of the hoop and pin it to the material. Make sure to place the pins out of the range of your image. so that when you take them out you don’t carry ink onto a spot where you don’t want ink. I use Speedball Fabric ink, applied with a stiff round paint brush, stipling it or dabbing it onto the open areas of the silkscreen. I go over the open areas thoroughly to make sure the ink has been pressed through the screen. Once I’m sure the ink is on the cloth I remove the pins and very carefully pull the silkscreen away from the material leaving behind the image. I take my hair dryer, which gets very hot and I blow dry the wet ink for about 4 minutes to heat set it. Make sure the cloth won’t blow away if it’s a small patch peice instead of a whole T Shirt. I pretty sure if you leave the screen in the hoop and place it face down on a good peice of paper you can pull an image in this same way, stipling the ink onto the paper. I guess you would just use regular screen printing ink instead of fabric ink. I share the finished Marc Bolan silkscreen when it’s done. I’d had enough of the post Vampire Red fade to yellow and decided to get back with my old used to be. I pulled the box-with-the-fox red off the shelf at the natural foods store. Picked up some wheat grass, a Guru drink, some sprouts and resisted the temptation of a crumbly scone. At home I poured the green herbish powder into a glass bowl, added water, strirred it up with a chop stick and stuck it in the microslave. Reheat 2. The soup setting. Let cool. Cover the yellow hair in warm mud. Apply hair dryer to plastic wrapped head. Sew a few chimp hands. Remove bag and rinse. Ah, better. This was an early morning shot. I’m groggy and I look it but I feel so special with my unrealistic copper tresses. The bangs are the result of a new hair cutting technique. I combed the hair on the crown forward and did a Prince Valiant thing. It will look better when it grows out. I worked up my silk screen prints of Iggy. He looks good. I like both the very dark one and the image with some white in it. This image may need a white frame or gold. I could see silver, too. I will have to experiment with materials other than fleece. I have been thinking that I could just sew it straight onto the hat with interesting thread. They have metallics at JoAnn’s. I have a coupon. Don’t try to stop me. ♥Marc Bolan in his top hat will make a lovely adornment for a topper. Still finishing off the details of the reworked workspace, Sunday, I moved on to using the reincarnated cutting table. That’s my Lou Reed block print on a paper towel hanging off the brick on the left. All this glorious space was just waiting to be used. I pulled out some really cute cloth to try a design I’d dreamed up a few days before I began the big space overhaul. This patterned material has a repeating image of a sparkling girly skull and crossbones. The girl skulls are smiling and sporting a black bow. They have black-heart eye sockets and are surrounded by swirly curlyques. But why go on like this. Here’s a photo image of the end result. Pretty darn cute, eh? I love this hat. I decided I would cut just one from the bolt and sew a frame around the image. I am going to try these in various color combos — on black with a grey or dark pink frame, on pink with a black frame. All my caps are super warm and comfy. That may not be such a welcome image this time of year, especially in places like Redding where we are feeling the 108 degrees, but check the DarcyArts shop mid-August for the premiere of my fresh line of head gear. I’ll give you an exact date early in the month. All you folks in the cooler places by the sea — I’m looking at you San Francisco — spread the word. You can have your caps all year round and yes, you will be digging them. Prior to this cute skull find I decided I would try the framed image cap with my Iggy Pop Raw Power image. I’ll have to cut Iggy off at the shoulders. He won’t mind. He’s a mighty man who’s done great work. His manhood is assured in a number of ways. Oh, stop. I used the embroidery hoop silkscreen technique on pieces of Tshirt material to make patches. Handy people can buy them and sew them onto anything they want adorned with Iggy. The fabu photographer Tricia Cluck recently purchased an Iggy Patch to make a special gift for a beloved two year old. I think this cropped version of the Iggy image would look great on just about any color. Trisha Cluck works with artist Jesse Mosher, a maker of rock images himself and a fellow etsian. Mosher has been inspired by a lot of the same people I admire. One of my favorites is his black and white Keith Relf. 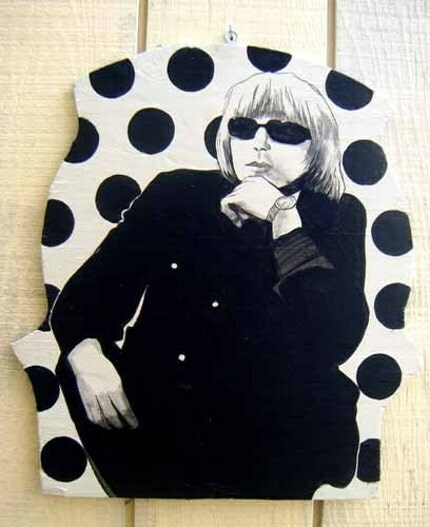 Ever heard of Keith Relf? He’s was the singer/harpist for one of the greatest Bristish bands, eva. The Yardbirds, were meaty with guitar sound pioneer Jeff Beck and for a nano second, blues purist Eric Clapton (snooze) and the magnificent and super attractive (still is) Chris Dreja. The rhythm section with the churning groove fewas made up of fine drummer Jim McCarty and original bassist Paul Samwell-Smith. The Mosher image is simple and beautiful and I wish I had the bucks to buy it. Buy my hats people of the world and I’ll spread the cha chang. Taking a trip down a well trodden lane, I loved the Yardbirds well. They rocked. Spent Saturday reorganizing my big work space. It’s part of the living room but is now more distinctly separate. It’s the second location for this art space. I initially set it up in the laundry room when we first moved to Hamilton Street. Wanted a nice high work table on which to cut material and take photographs. A clean space. Also wanted to have all my cloth in one place so I can see all the possibilities when I am composing. The paint/draw table has plenty of good light and I managed to squeeze in a couple of storage shelves beside it. I can see the paints and all my notes on the red wall cloth for projects I have to work up. I can do earrings, necklaces, block carving and prints here. There’s more of the 360 tour of my new work space. This is the yarn bin. It’s an old 70’s style waterbed headboard that I salvaged. I turned it on it’s side. You can barely see it there by the yarn bin, but check out the cute Chetart barnyard postcard on the wall. You must go to the Chetart.etsy site now!! I guarantee you will find an image that you love, or funny cards, or monkey buttons. Chet Phillips is a champ and a great inspiration for me! 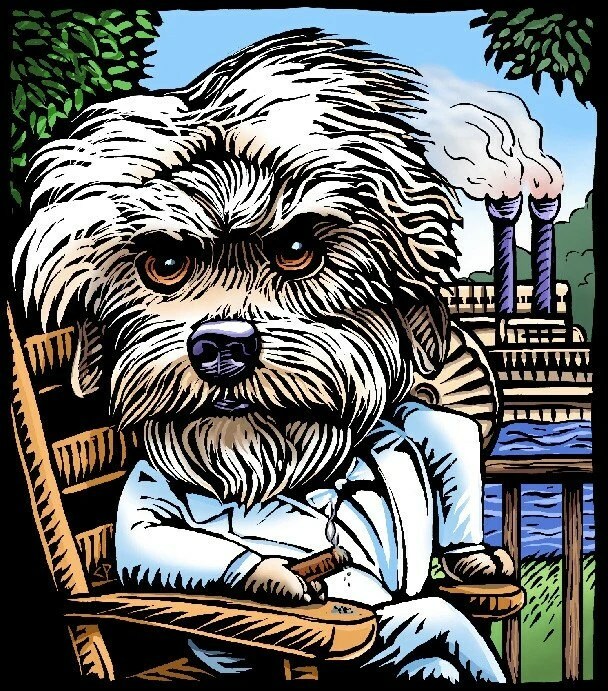 Just bought this Chetart illustration of the canine version of beloved writer Mark Twain. 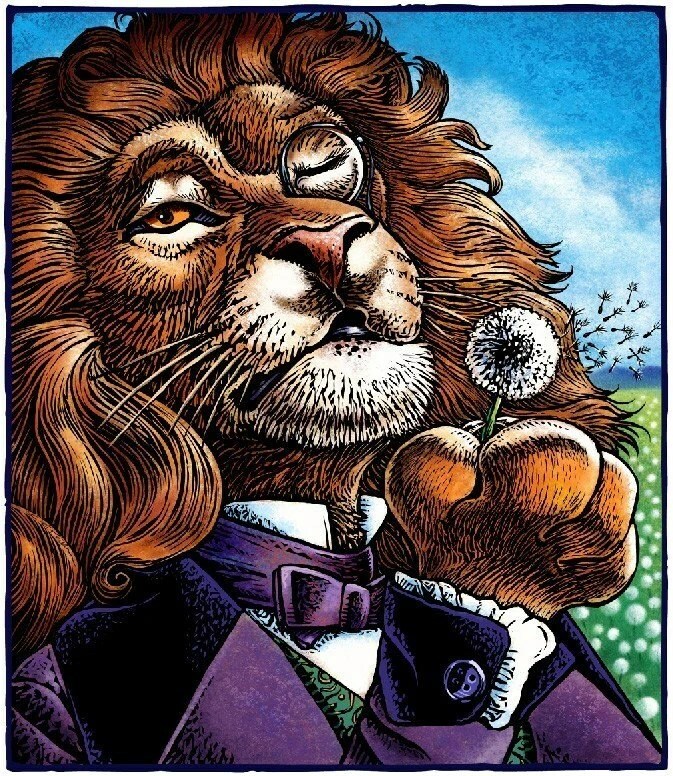 Also found this image of a lionesque Oscar Wilde irresistable. Okay, back to the work space. I left the printer’s box with all my stamps in it’s old location. It’s the best place for it. The new computer space is so comfortable I’ll be sorely tempted to spend way too much time surfing the blogosphere. I’ve got the radio/CD player close by. I’d turn it on now but listening to Will Shortz dish out the puzzle of the week makes me feel wholly inadequate. It might keep me from getting Alzheimer’s if I were to apply my old brain but, dude, it hurts. It will all be over in a few minutes and I’ll tune in to Radio Lab! Umm . . . Good. This is going to be a great summer retreat. Lou Reed is singing The Gun. I believe Lou Reed is a master. 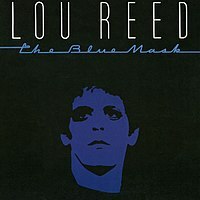 This well crafted song is from his remarkable 1982 album, The Blue Mask. It’s one of my favorite Lou LPs. It’s the iPod Nano and iTunes. Far too easy to buy music. Amazon.com, too. Far too simple. Far too immediate. Self control? I’m grazing through the Iggy Pop and then Genius suggests more. And, yes, those do sound good. And, yes, I do need to click on that icon as fast as Genius can pile them up on the screen. Waves of Fear, also from Blue Mask. Chelsea Girls, a Lou song recorded by Nico. Velvet Underground 1969’s Mr. Rain, of course. Iggy and the Stooges I Got A Right, the incendiary version, give it to me. Here’s an amazing version of I Got A Right wherein Iggy, sans Stooges, is forced to lipsync. Don’t try to make a Taurus do anything he doesn’t want to do. Okay, Spacemen 3, if you say so. Did Genius only suggest them because the tune is called Velvet Jam? Must be cuz it’s kinda corny hearing it now for the first time. But weren’t they big time hipster groovers? I expected more. I began to look at the ever growing list alphabetically. Geez, it’s cool and weird. To listen that way can be rather jarring. Especially since my taste runs from the quietly sublime — Fleet Foxes, Mark Olson, Gary Louris, Robyn Hitchcock (Trains), Erik Satie — to the take no prisoners best of rock. No, make that Rock, with a big old capital “R” — Stooges, Queens of the Stone Age and in between in the sweet spot, Roxy Music, Robyn Hitchcock, again (Freeze, I Want to Destroy You), Velvets and Meat Puppets. In the last 10 minutes I heard Roxy Music’s Virginia Plain right up next to Jim Dyar’s Walkin’ On a Ledge. The Queens of the Stone Age with Walking’ On the Side Walk the Lou with Waves of Fear. Dig it, if you’re able, Mabel. Now I understand why one needs 120 GBs. You just fill it up and get more rad combos. Shock me. Netflix will be shipping Henry Selick’s film Coraline for Thursday, they say. I hope it comes early. I was tempted to buy a copy at WalMart earlier today but I’ll see if free first. Having seen the promo short for the film I’m pretty sure I will enjoy it just for the mind boggling hand crafting involved in creating it. That sort of tiny world construction seems like a dream job. Well, maybe if I could get really good glasses. I hope it’s not too dark a story line. It seems kinda scary, with hints of facist monster parental ickiness. Check out the work on the movie set.